The General Services Administration (GSA) may have just put the first nail in the coffin that eventually will bury the widespread use of lowest-price, technically acceptable (LPTA) contracts for services. The Government Accountability Office’s decision to deny four protests of GSA’s Alliant 2 contracts for IT services could end up being a landmark ruling that is that first nail. 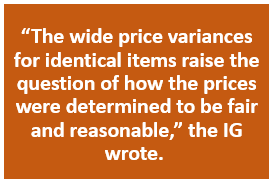 Despite years of efforts to streamline multiple award schedules used by information technology resellers, the General Services Administration (GSA) has been offering many identical items at varying prices, said an inspector general’s report released last week. IT resellers typically buy computers and software in bulk and then add value through customization before selling the adopted product to agencies or commercial customers.